I should highlight the size of the charger: very large. If you are used to the travel type of chargers which usually include other brands, this one will not go unnoticed because of its size (I guess I can power my laptop with it). At least, the AC adapter is quite effective and can fully charge the phone in a couple of hours. 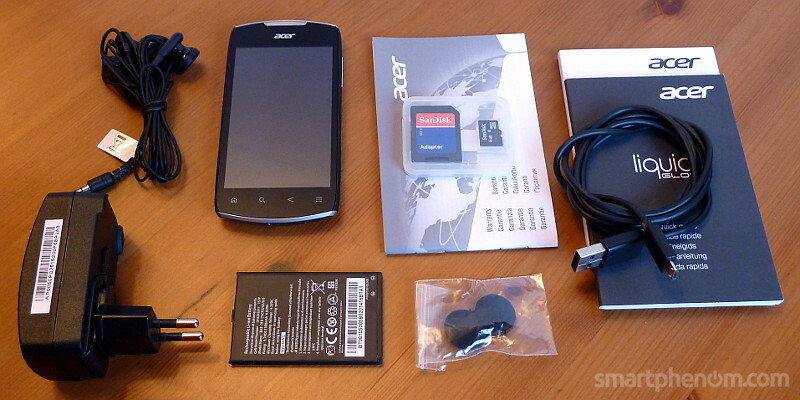 Moreover, Acer has had the good sense to include a two-piece charger, with a dettachable USB cable that doubles as data synchronization cable with a PC. The stereo headphones are In-ear type and they also operate as hands free. The quality of the headphones is nothing to brag about but it's pretty decent for a smartphone this price. The set has a small switch (mounted on the cable) to answer calls without taking the phone out of your pocket (in other phones you have to toggle a control on the screen, which is quite inconvenient). In the box we also find the battery (we'll talk about its performance later on) and a microSD memory card with an SD adapter (thanks!). The phone has come with a 4 GB card, although this may depend on the sales package of each country (ask your dealer). And finally we come to the phone. My first thoughts when I pulled the phone right out of the plastic bag was .. how pretty!. 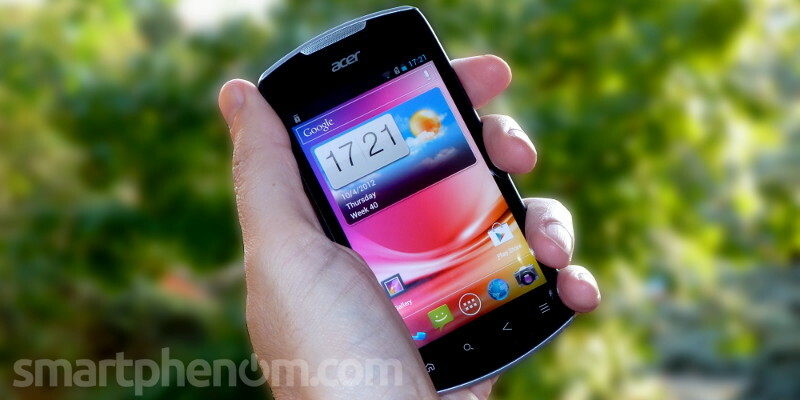 The handset is quite compact (117 x 58.5 x 11.5 mm) and pleasant to hold in the hand (125 g). Its rounded edges and rubber finish on the rear cover allows for a safely grab (besides repelling fingerprints quite effectively). Aesthetically, the Liquid Glow is well accomplished and looks much better in real life than in pictures. Mine is the black one (also available in white or pink), and combines the overall black finish with some elegant silver accents. Of course, at this price you'll not expect the metallic pieces to be actual metal but painted plastic (like most phones), but the quality of the materials used is quite good. At the front of the phone there is the 3.7 inch capacitive screen, whose analysis I'll conduct in a separate post. 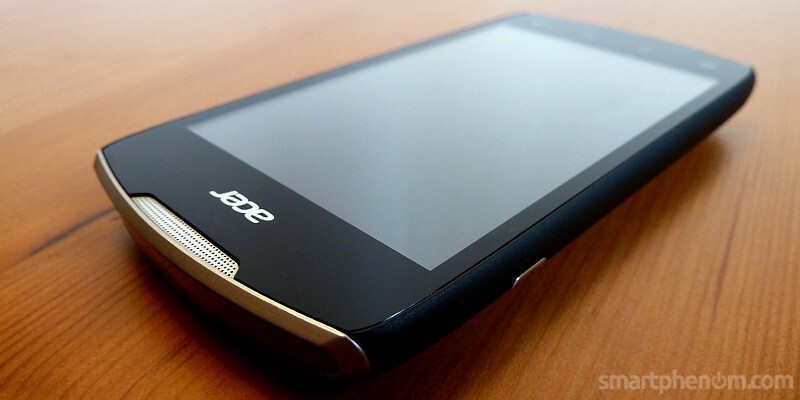 Horizontally, the screen bezel is quite small, which is appreciated to keep the device svelte. Vertically, however, the bezel is much broader to make room for the earpiece and the capacitive button bar at the bottom. 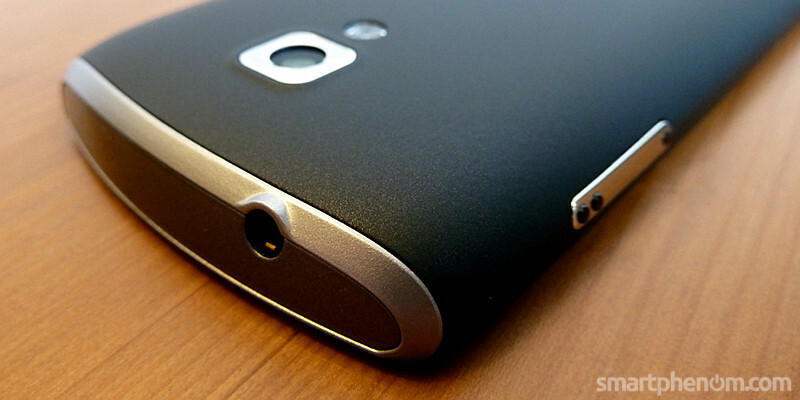 Overall, the phone has an elongated silhouette, but comfortable to hold. It is noteworthy that the screen cover is plastic (does not have Gorilla Glass), so it is highly recommended to use a screen protector to avoid unwanted scratches that ruin your pristine display. Do not carry this phone in your bag without protection. The earpiece is under a metal grid allowing a good transmission of the sound while preventing the accumulation of dirt; a touch of luxury in a terminal this price if you ask me (more expensive phones have just a hole with some foam within). Along with the earpiece there is a proximity sensor to adjust the screen brightness (depending on the ambient light) or to switch it off completely when the phone approaches the ear to make a call. The Acer Liquid Glow has no front camera for video conferencing. The phone has 4 capacitive buttons below the display (home, search, back and menu) that glow when they are touched. By having all these capacitive buttons on the front face, the phone only has two physical buttons, placed on either side of the device. 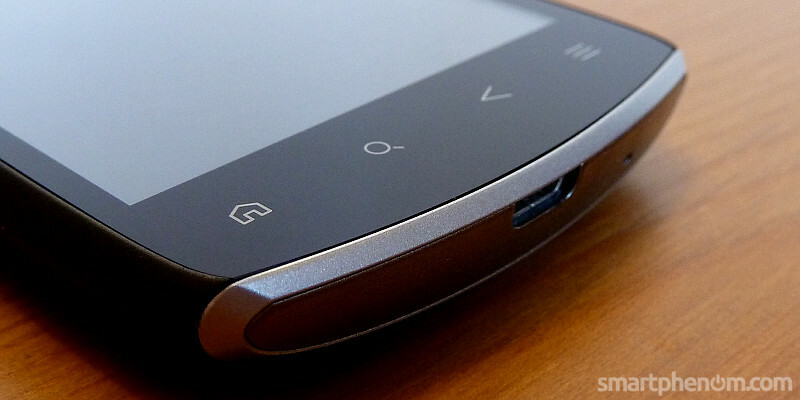 Below the capacitive buttons, at the bottom of the handset, Acer has placed the micro USB connector -for charging and syncing the handset- and also the main microphone hole (the Acer Liquid Glow does not have an auxiliary microphone for noise cancelling). On the left side we have the power button, to which I do not quite get used to, because it is very small and barely protrudes from the body of the phone. The advantage is that it is not easily pressed accidentally when, for example, the phone is in the pocket. But, on the other hand, this also makes it difficult to locate by touch and I end up looking to the side to see where it is. At the top of the phone there is nothing special, except for the stereo headphones/hands free jack. As with many other phones, the hole is not deep enough for a regular headset to plug in completely (it protrudes a few millimeters when inserted). The included headset doesn't have this problem though (fits in perfectly) but you may want to replace it anyway with a better quality equipment. In the back of the phone there is a 5 MP camera whose performance I will review later. The camera has a LED assist for low light snapshots. Fortunately, the Acer designers have embedded the camera a millimiter in the body of the phone, protecting the camera lens from scratches and, most importantly, letting the phone to lay flat on the table. The back cover is robust and fits well in the phone (nothing to do with the flimsy Galaxy S2 cover, for example). It leaves no gaps through which to enter the dust and, as I mentioned before, the rubbery finish is very nice. At the bottom side of the cover there is the loudspeaker. The output is adequate but because of its placement the volume tends to be muffled when the terminal is on a table, on the bed, etc. ..
Below the back cover we'll find, apart from the the battery bay, a SIM card slot (of standard size) and a MicroSD memory expansion slot of up to 32 GB. Next to the LED assist light there is also a golden connector whose purpose is to link the phone with the NFC antenna located on the back plate of the phone (yes Apple, 150 EUR is sufficient for a smartphone to have NFC circuitry). 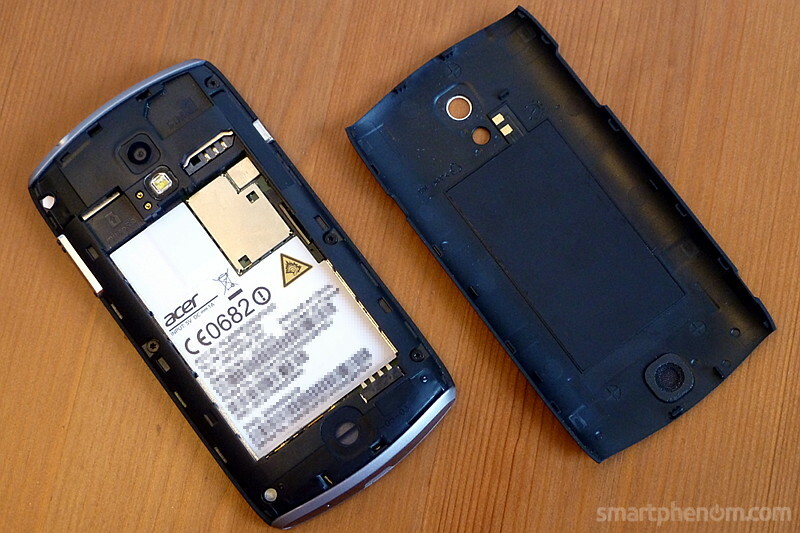 Installing the NFC antenna in the back cover makes the battery easier to produce and reduces its price, something other manufacturers should learn from (LG does the same, in their NFC equipped devices). To summarize my first impressions I would say that Acer has produced a very balanced smartphone (with very few design flaws), partly because of the materials used but also for the build quality (I have not found any creak, or squeak of any kind during my tests). I have had in my hands a lot of more expensive phones that did not gave the good feeling that the Acer Liquid Glow offers. 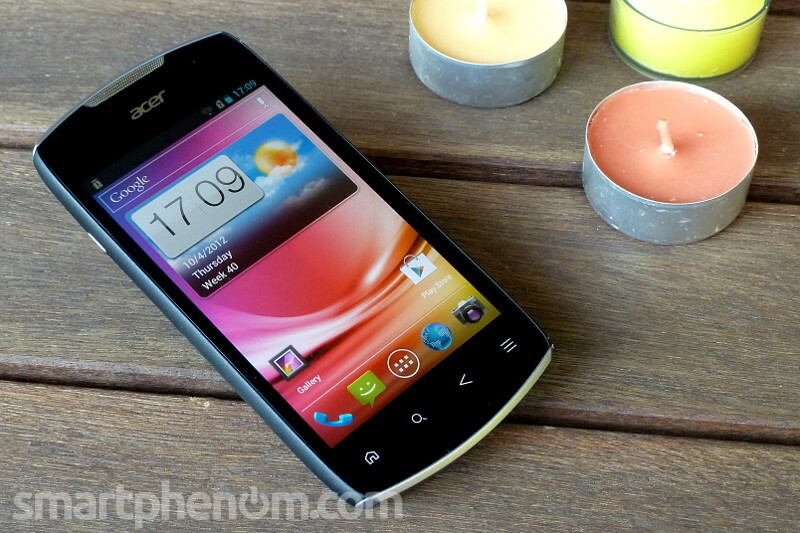 Of course, I'll raise my conclusion after the whole review but, for now.. well done Acer!